With the DHS4E4C192KL2B single-layer ceramic disc capacitor, you'll have no problems with heat dissipation. It can withstand a voltage of 15000 VDC. 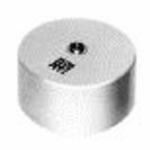 This high frequency capacitor has a maximum operating temperature of 85 °C. Its capacitance value is 0.0019uF. The DHS4E4C192KL2B high frequency capacitor has a screw terminal termination style. This product is 14 mm long with a diameter of 38 mm. It has a tolerance of 10%. The more you buy, the more you save - Prices breaks are available across related products. Copyright © 2019 The PUK. All rights reserved.